A freezer can either be your best friend in the kitchen, or eat hundreds of food dollars. Whether your freezer is part of your fridge or a stand-alone appliance, it’s important to use it properly — not just for the sake of taste, but also for your safety. If the temperature is not properly set, freezer burn can change the taste and texture of everything from ice cream to pork chops. The ideal temp for a freezer is 0 Fahrenheit (-18 Celsius) or lower. Items stored in shelves on the door will be more susceptible to temperature changes. 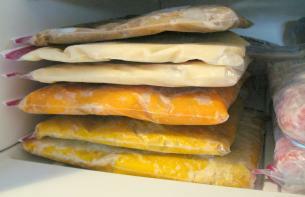 If your freezer isn’t set cold enough, bacteria can grow and potentially cause food poisoning. Along with getting the temperature right, it’s important to package food well before freezing it. Make sure you use containers that specifically say that they can be used in a freezer. Don’t think that tying a knot on a skimpy supermarket plastic bag does the job! If you were headed into an arctic tundra, would you wear a skimpy sweater? Heck no, so don’t send a pricey steak into your freezer with inadequate cover, either. One of the most common mistakes people make is sticking meat that’s been packaged in a foam tray and cling wrap directly in the freezer. By no means is that enough to protect your food, people! In most cases, fresh meat should be repackaged in tin foil, then over-wrapped. Make sure there are no holes or rips in the wrap or containers you are using, as air and moisture affect the length of time that food stays good in the freezer. Plastic freezer containers only work if the lid shuts tight; plastic freezer Ziploc bags are another safe option. Date the bag, fill with food, squeeze out the air and then stack the bags in the freezer. Avoid buying freezer wrap — a thicker version of cling wrap — which, in my opinion, doesn’t keep out air or moisture. How Long Can That Stay in The Freezer? How long something stays in the freezer is also important. Did you know that you can actually keep margarine in there for a whole year, but a baked pie gets that musty taste after just a month or two? I like to mark everything I put into the freezer with the date and what it is. That way I can tell whether it’s still safe to eat. I’m a big fan of keeping a box of baking soda in both the refrigerator and the freezer to chase away smells — as long as you change the box every 3 months. Of course, if you’ve got a smell in the freezer that doesn’t seem to go away, it’s probably time to clean out the box and make sure that temperatures are still properly set. Be good to your freezer, and it will be good to your food. Great tips! I guees I should invest in some thermometers for the fridge and freezer. I’m guilty of just throwing the meat in the packaging unless it’s a jumbo size that needs to be separated into smaller portions. Hi Mary, It is so worth the effort to properly wrap foods before sticking them in the freezer. There is nothing worse that freezer burn! I’m VERY partial to using the new freezer bags that take the air out! After spending good money on meat/fish/poultry, i do not want to take out my great grocery buy and find that there is air in the packaging and see ice crystals formed from the moisture in the food. That means freezer burn! No air pockets & tightly wrapped – best freezer packaging. ALWAYS rewrap fresh meats/fish/poultry into portions.